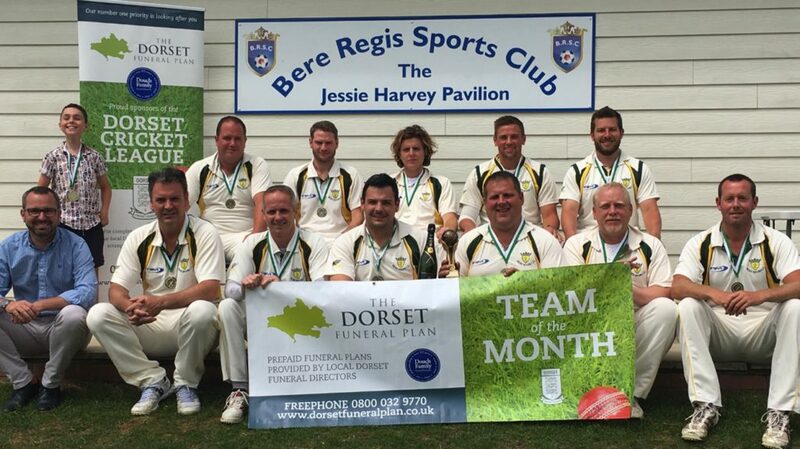 Bere Regis Cricket Club first eleven won the Dorset Funeral Plan Team of the Month award for June after four wins and taking 76 points from a possible 80. The team are leading Division One and the month of June saw them defeat two rivals for the top spot; Cattistock and Christchurch. 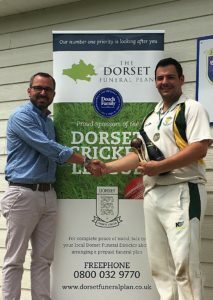 Skipper Rich Cole was presented with a trophy and bottle of bubbly by Shane Watson from sponsors, Dorset Funeral Plan. Rich said: “We’ve had a settled squad of 13 and have a very strong second team which is helping us. Everyone’s chipped in with the bat and spinner Dave Griffiths has taken lots of wickets as well as being economical. “We’re lucky as many committee members give up a lot of time to help out and to coach the kids. Shane Watson added: “Both Bere Regis teams have done superbly this season and the firsts deserve the award for their almost perfect performance in June. Dorset funeral plan is a service dedicated to arranging prepaid funerals provided by Douch Family funeral directors in Dorset. Learn more about our funeral planning services here.